"In May 2018 I ran the Annecy Maxi Ultra race which, unknowingly, gave me my first 6 points towards entering the Ultra Tour de Mont Blanc (UTMB). I'd heard of the UTMB before getting into running and thought it was the most ridiculous thing. To apply for the UTMB ballot you need 15 points from 3 races. It seemed a shame to waste those 6 points so in November I hatched a plan to get 9 more – quickly - because in 2019 the UTMB organisers were planning to increase the points needed for entry! In November I had a lovely trot around the Gower Peninsular. It was less than half the distance of Annecy so I made the silly mistake of thinking that it would be easy. I set off too fast and paid the price for the rest of the race. The event had a very odd format which involved 3 races of varying distances on the same course with staggered start times. This meant that you had no idea who was doing what and keeping to a pace was nye on impossible! Or was it just me? The moody skies and stunning views made the race but I wouldn't rush to do it again! Nevertheless 3 more points in the bag. A few weeks back I had my biggest running adventure ever. Getting the kit together felt epic. And then an email arrived saying the weather was going to be bad bad bad - so I begged, borrowed and scrounged even more kit (thanks everyone who helped out) and finally I had 4 bags of more technical gear than you could shake a stick at. Eight pairs of waterproof gloves felt excessive but 24 hours later I was concerned I'd not got enough. The coach to the start allowed 3 whole hours of faff at the salubrious Llangdog community centre. It's amazing how fast time goes and how many variations of kit combinations you can come up with to divvy up between 3 drop-bags. 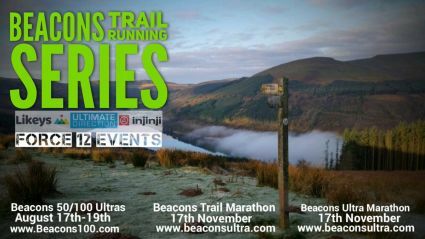 In a similar way to being shocked that over 1000 people started the Annecy ultra in May, I was surprised at just how few people had signed up to run 100 miles across the Brecon Beacons in December. At 7pm (why oh why did they not set us off at 7am??) a whopping 43 starters headed out into some classic Welsh weather. I'd ignorantly thought the Beacons Way was going to be as well trodden and signed as the Pennine Way – it turns out it's not. The field spread out over the first hour and I realised navigation was going to be a major issue so I quickly found a competent person to befriend. After another hour I couldn't take being shouted at any more; C was not the man I'd hoped so I reluctantly struck off on my own. It felt overwhelmingly bleak and lonely, cold and wet. I was questioning my sanity when I happened across D who was a lot less shouty and just so happened to have a GPS navigation device – phew! For those who haven't run through the night, you should - it's magical and a very surreal experience. Time does strange things - hours can pass by faster than minutes and at the same time seem to stretch into days. It felt like we were stumbling across one boulder field for an eternity but by the first checkpoint I struggled to remember much of what had just passed. At some point during the first night we teamed up with a gritty 22 year old (who'd never run further than a marathon and appeared to be wearing his Dad's shell suit) and arrived at the very tiny and busy Checkpoint 1 together. 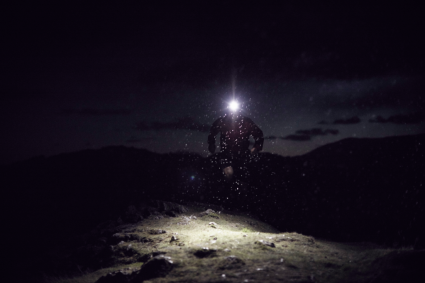 After some impressively underwhelming food (options being canned chicken curry or canned meat balls) and doing the first of many wet-for-dry kit swaps we set off into the dark again. Though this time I had my spanking new running poles to try out. I apologise to all those pole-wielding people I've looked at disapprovingly over the years – I was ignorant and judgemental and I am sorry. They are amazing and I am now one of you. The next 24 hours came and went. As did the hills and the rain and the wind and a few highs and lows of emotions and at least 3 pairs of gloves. After 50 miles and a slight sense of humour failure pre-arrival, Checkpoint 2 was like nothing I'd seen before; it was complete carnage with bodies, mud and puddles everywhere. Despite trying to be quick, it took a couple of hours to get warm and dry and ready for off. At some point A the student had joined our little team so now we were 4. The next section is even more of a blur. It included a very long slow plod up Pen y Fan, being floored by the wind at the top time and again, a pretty depressing realisation that the second night was approaching, a never ending path (that brought me close to tears) and a very, very pleasant bag of crisps and pint of coke by the fire in a pub. By the time we arrived at Checkpoint 3 the two youngsters were seriously flagging and decided to call it a day. D and I hatched a plan to sleep for an hour and then go again. When my alarm went off I had a very trippy moment where I woke up and went tip-toeing round the room looking for my sister. I was getting increasingly annoyed with her for setting off without me but then thankfully found her. In reality, I'd found an exhausted runner and shook him awake whilst whisper-shouting 'Pegs' at him. I've never seen a more horrified look of confusion so I told him I was looking for Pegs to which he sympathetically replied that he was very sorry but he didn't have any pegs with him. He then turned over and went back to sleep - I wonder if he remembers the lunatic waking him up or if our conversation got lost in his own disjointed dreams. Leaving Checkpoint 3 (about 75 miles) was a bit of a bugger. There was only ¼ of the race to go but those last miles were hard and slow. At one point D re-enacted the classic Doug Scott moment but there was no way I was leaving him AND HIS GPS DEVICE behind. I'd much prefer to be going slower, with company in the right direction than not. 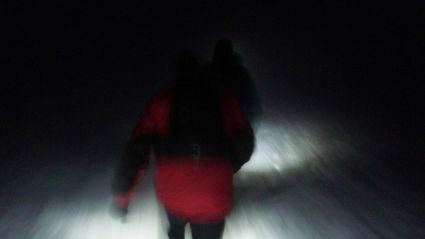 As we neared the end of the second night, time was still warping but only in the one, very slow direction - every metre felt like a mile and the hills just kept on coming. Keeping eyes open was as tough as keeping legs moving. On straightish, flattish ground I discovered it's possible to run and doze for about 7 seconds. After about 10 sets of 7 seconds you do feel slightly refreshed. The sun came up and lifted our spirits and we tried to keep chatting – though plodding for 40 hours with a complete stranger and no sleep doesn't make for the most intelligent conversations - and often they just stopped mid sentence and neither of us could remember what rubbish we were saying. Finally, finally we got to the top of the last hill and Abergavenny was just a couple of miles away. But oh no – we were to do a lovely long loop to get there. I did not like that loop one bit. It was unnecessary and I truly hated the race organisers for making us do that last loop. There were no Umpah bands or crowds of supporters at the end. Just one man and his iphone and a couple of primary school chairs covered in bin liners but it felt amazing all the same and I was so grateful that I hadn't had to do it on my own as I really don't know if I'd have made it. D felt like my new best friend but who knows if I'll ever see him again? The journey home didn't start well - 5 minute drive, 1 hour sleep, 10 minute drive, 45 minute sleep, followed by my lowest moment of the weekend when I just wanted to be home. Thankfully, I was revived enough then to make it back to a home made curry in a one-er. Another 6 points collected! I am now officially in the ballot for the Ultra Tour of Mont Blanc." "An ultra-marathon is defined as any race exceeding the standard marathon distance of 26.2 miles or 42.2 kilometres. The calendar for such events is becoming busier, with new events appearing every week, in a variety of terrains, from city based ultra-marathons to remote mountain events. The format also varies from non stop races over a certain distance to stage races that take place over a number of days or even weeks. With this comes a greater need to appreciate the physical and mental effects upon competitors and a knowledge of what can be done to support them. This is the most important part of an athlete's ‘safety net’. ‘Cut-offs’ are timing points that must be achieved if an athlete is allowed to continue. Although these might seem a little harsh, enforcing "cut offs" ensures that those who are struggling in the early part of the event do not put themselves or others at risk at a later point on the course. 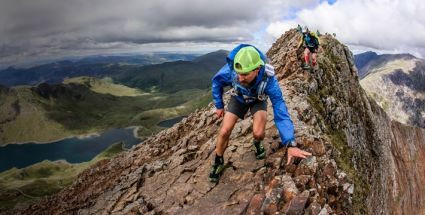 During the five day Dragon's Back Race athletes set off from 0600 each day and have to complete the day's course by 2300. Any athlete who finishes after this time is withdrawn from the event. In 2017, only 127 out of 223 competitors (56%) completed the event. Generally, people are understanding and have realised for many hours that they are not going to make it in time. However I have seen one incident where a participant was timed out at a checkpoint and became rude and aggressive towards event volunteers. He was subsequently disqualified from future events. An increasingly popular feature. Not only does this plot the location of a participant in real time, but it also contains a ‘SOS’ button that can send an alert to the race organisers in the event of an emergency. Such a system is not fool proof! 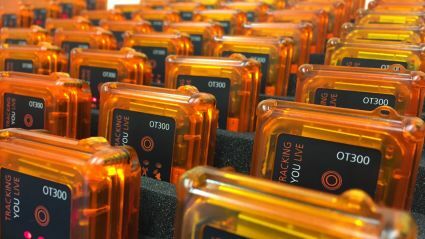 The most commonly used tracking system in the UK relies upon the mobile phone network and will therefore fail in "black spots', a real possibility given some of the remote locations where these events take place! 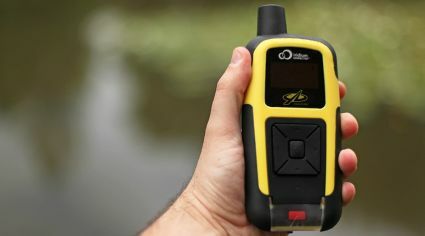 YB Trackers, that use satellite communications, are used for the Cape Wrath Ultra in north west Scotland. This varies from race to race but can provide a useful gauge of competitor’s previous experience. There is, however, no getting away from the fact that human nature is sometimes prone to exaggerate prior achievements and therefore any vetting procedure should not be relied upon as an assurance of a competitor’s ability to safely complete an event! Behind every event lies an army of volunteers. These people are vital to every ultramarathon. Larger events, such as the Dragon’s Back Race will have dedicated response teams. These are two person teams that respond to incidents on the course and prove a very reassuring "back up" for competitors. Typically, teams working on the Dragon's Back Race are deployed on average once per day and deal predominantly with musculoskeletal injuries. Occasionally, athletes need to be treated for hypothermia and sometimes those at the back are provided with a bit of TLC and encouragement! Organisers should ensure that athletes are both physically and psychologically prepared for the race. A comprehensive and clearly presented website is a vital starting point. This should be supplemented with regular email communications that provide all the information that is required to complete the event safely and successfully. Crucially, any "cut off" times need to be announced well in advance! On the day of the event participants should all attend a face-to-face safety briefing. Since time is often short, these should focus upon the most important safety aspects of the event. Any safety briefing should also include details of what facilities are provided after the event. As Kat described, any ultra marathon is not over until the competitor has safely returned home! A sleeping location should be provided as a minimum - even if's just a farmer’s field or car park! In my time as an event medic I have gained an incredible insight into the unique challenges that ultra marathon participants face and perhaps more importantly, seen the aftermath of when things go wrong. Some of these will be covered in future blog posts!"